I have twice the jonas brothers in concert!!!! Then if wanted you for example authographes (I send them to you by e-mail) or if wanted you to know how sound their concert you can ask me on MSN!!! Always in the point(headland) of the fashion!!! en français : Les jonas brothers sont toujours à la pointe de la mode !!! !avec leur look 60' j'adore !! Kevin knows how to juggle. Kevin began the guitar by finding an intitulié book " Learn only to play the guitar " one day when, patient, he(it) had of to stay at home. So fascinated, he(it) pretended to be sick the next day to be able to continue to train. what he(it) possesses of more precious is his(her) "Gold Top Guitar". he likes films High School Musical and his favorite character is Sharpay. his(her,its) "registered trademark" is the bandana. Kevin would like to play with U2 and Coldplay. he(it) likes playing " Still in Love With You " because he(it) has a solo of guitar. he does not like fruits and to have to eat no it he claims to be allergic to it. as his brothers he carries(wears) a ring of purity. his(her,its) figure carries(wears) happiness is 15.
the faith is important for him and his(her) family. it has for bad habit to let drag its clothes everywhere. Kevin is crazy about his iPhone and about Myspace. Favorite song: Stevie Wonder's " superstition "
Nick suffers from type 1 diabetes. His(her,its) disease was diagnosed in 2005 during their tour. he(it) began to play Broadway at the age of 7. He(it) played in " The Miserable ", "Beauty and the Beast", " Annie Get Your Gun ", and "The Christmas Carol". his high-octane gasoline - héro favourite is Spiderman. that does not disturb him(it) to be called " that with the curly hair ". as his brothers he carries(wears) a ring of purity. The word " Poned " is registered inside what means " being left fallen or disappointed ". it was discovered at the barber's while he had the hair cut. the song "SOS" is based on one of his(her,its) past experience(experiment). his(her) favourite team of baseball is the one of New York, the Yankees. Nick plays the guitar and the baterie. the chason which he prefers to play in concert is " Year 3000 ". Joe carries(wears) from time to time glasses because he is nearsighted. his(her,its) destination preferred for the holidays are the Bahamas. he would like one day to go on the moon. he would like to play with U2, The Police, Will Smith and Rascal Flatts. Joe was really incited to the birth of his small brother Frankie. First night at the house after the hospital he got up to help his mother to give to him(her) to eat and to change him(it). his(her,its) nicknames are JJ and Danger. 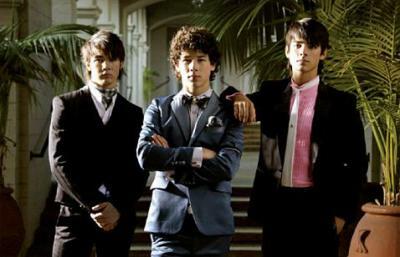 his(her,its) favorite songs of the album "Jonas Brothers" are "Australia" and " Still in Love With You ". his(her,its) favorite word is Supercalifragilisticexpialidocious. if he could exchange his brothers for whatever celebrities he(it) would exchange Kevin for Shakira and Nick against Beyonce. his(her) character preferred in High Schol Musical is Chad. the song "Mandy" speaks of his(her,its) about ex-girlfriend. Joe went out with Amanda Michalka of the group Aly et Aj.